Instructions for the use or administration of the medication, e.g. dose and route of administration. In the event of medication use, this is the pattern of use established by the patient or which the patient followed. InstructionsForUse gives an insight into the manner a drug is to be used. NL-CM:9.12.22504 InstructionsForUse Root concept of the InstructionsForUse partial information model. 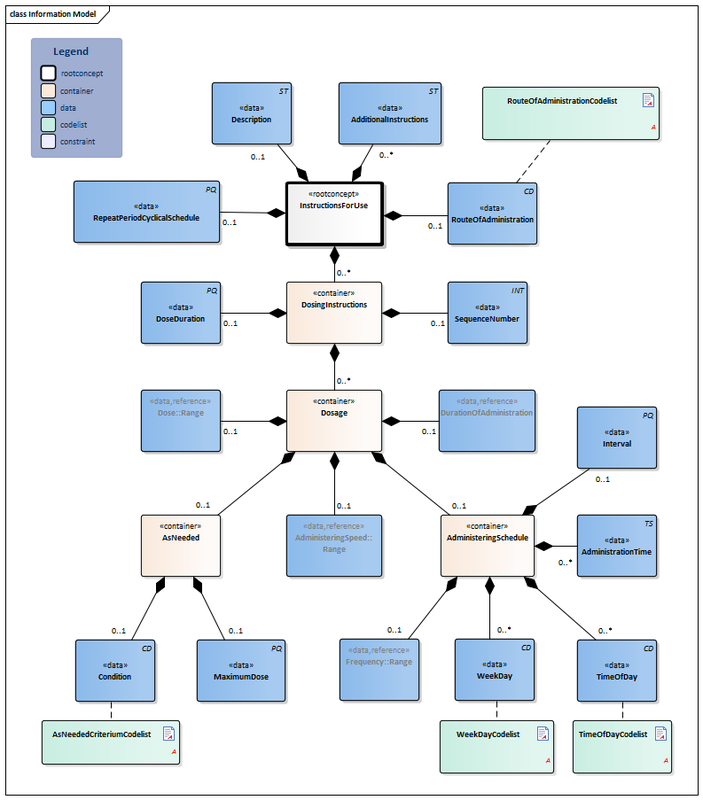 This root concept contains all data elements of the InstructionsForUse partial information model. NL-CM:9.12.19944 AdditionalInstructions 0..* The additional instructions contain extra information on the use of or considerations for the current prescription. This can also include all instructions for use. The text can come from the original “paper" medication prescription, but can also be generated from the coded information. This concept may contain more information than what is structurally coded in the information below, but may not conflict with it. The instructions may not conflict with other components of the request for administration. The instructions can also refer to an existing protocol. The G standard contains many texts that can support this attribute, in for example G standard table 362, which contains texts from the general practitioners’ standard WCIA table 25. If desired, these texts can be used to structure this concept. NL-CM:9.12.9581 Description 0..1 Textual description of the complete instructions for use including the period of use. NL-CM:9.12.22505 RepeatPeriodCyclicalSchedule 0..1 The repeated period in a cyclical schedule (of one or more dosing instructions). A cyclic schedule is noted in days, the corresponding dosing duration is also in days. NL-CM:9.12.19941 RouteOfAdministration 0..1 The route through which the medication is administered (oral, nasal, intravenous, etc.). NL-CM:9.12.22506 DoseDuration 0..1 The intended time duration for these dosing instructions, e.g. 5 days or 8 weeks. In the case of medication for an indefinite period, the dosing duration is left empty in the last dosing instruction. Leaving dose duration empty should only be used for medication for an indefinite period. NL-CM:9.12.22503 SequenceNumber 0..1 This indicates the sequence of the dosing instructions within the medication agreement. NL-CM:9.12.19935 Dosage 0..* Container of the Dosage concept. This container contains all data elements of the Dosage concept. Instructions for the administrator to administer the medication (the patient themselves, a nurse or other aid). When taking stock of medication use, the dosage describes the pattern of use established by the patient. Once the dose schedule (distribution of doses over time) and the dose have been determined, then there should be one single instruction for use. Multiple parallel instructions for use can be included in the event of a changing dose within one day and in the event of a variable use frequency. Multiple sequential instructions for use can be included in the event of changing doses within one period and/or in the event of a changing dose schedule. NL-CM:9.12.19942 AdministeringSpeed::Range 0..1 The administering speed is used in slow administration of liquid. In practice, the measuring unit is almost always ml/hour. Entering an interval (such as 0-10 ml/hour) is also a commonly used option. Optionally a translation to NHG table Gebruiksvoorschriften(Table 25) is also allowed. NL-CM:9.12.23141 DurationOfAdministration 0..1 The duration of administration defines the length of time during which the drug is administered and is mainly used in the slow parenteral administration of fluids.Optionally a translation to NHG table Gebruiksvoorschriften(Table 25) is also allowed. NL-CM:9.12.19940 Dose::Range 0..1 The dose indicates the dose amount per administration. The dosage is described in the unit accompanying the product; usually, this is just a number of units or doses. Liquids and other divisible products will usually include a unit of volume (preferably "ml"). In many cases, the prescriber will want to indicate the dose in units of weight of the active ingredient. If only the ingredient is included and not the product, then the amount of that ingredient will be given. Paracetamol 1000mg is equivalent to 2 Paracetamol 500mg tablets or units. The dosage is sometimes given as a calculation, in which the patient’s body weight or body surface area is used as a parameter. The calculation is however no more than an aid in reaching a decision. In the event of constant administration, sometimes the dose is given in addition to the administration speed (infusion rate) (e.g. 20ml in a syringe or 500ml in a bag), but it is often also omitted. A general dosage recommendation such as ‘Use according to protocol’ or ‘See instructions’ can be sufficient. In that case, no dose is given. NL-CM:9.12.22512 AsNeeded 0..1 As needed means that the dose is only to be administered under certain conditions. See also the Instructions section for more information about use of the element. a symptom or other circumstance (in the event of a headache, or itch). Relevant B codes in Table 25 make up the list of values for coded entering of this concept. Also always include the textual description of that code. Physiological measurement values or other conditions that do not occur in the B codes in Tabel25 do not need to be coded. These can be expressed in free text in the Description concept. NL-CM:9.12.19946 MaximumDose 0..1 A maximum dose indicates the maximum duration a product can be used with an ‘as needed’ prescription. Time(s) (16:00) or indications (“before meals”) at which the medication is to be taken each day. A specific number of times the medication is to be taken each day ("3x a day"), indicated with the frequency. A time interval between consecutive doses (“Every 2 hours”, “every 3 days”), indicated with the word Interval. ”3x a week”, “2x a month”. A specific amount of administrations has been reached (“20 doses”), to be entered in the Frequency concept. NL-CM:9.12.19949 Frequency::Range 0..1 The frequency indicates the number of dose moments per time unit, usually per day. If this frequency is included, then the Interval will not have been included. Usually, frequency comprises both amount and time unit (3 times a day), but it can occur without the time unit (single use). In that case, a reasonable distribution over the day is expected, but exact times are not given. This is left to the patient. It is the most common manner of extramural prescription. In the case of Baxter packs and intramural care, such a prescription is used to draw up a (location-specific) outline for distribution times (logistics). The time unit of the frequency must be the same as how it is indicated in the textual description of the dose. NL-CM:9.12.19952 WeekDay 0..* WeekDay indicates a pattern of doses on fixed week days. NL-CM:9.12.19953 TimeOfDay 0..* Time of day: morning, afternoon, evening, night. NL-CM:9.12.19951 AdministrationTime 0..* The time of administration is a specific time of day (on the clock). This time usually isn’t (intended to be) exact. There can be multiple administering times in one day. The ideal time of administration can also be entered as a time of day (morning, afternoon, evening, night-time). The administration time is then to be left empty, and the time of day can be entered in the TimeOfDay concept. NL-CM:9.12.19950 Interval 0..1 Interval indicates the time between dose times. If this is included, then the Frequency will not have been included. Examples: every 4 hours, every 3 weeks. The times can now be chosen freely, but distribution throughout the day is more precise, and the interval between times is important (e.g. in the case of antibiotics) In the case of Baxter packs and intramural care, such a prescription is used to draw up a (location-specific) outline for distribution times (logistics). Using the term 'as needed' or a specific reason (eg 'in case of pain') to use medication leads to ambiguity. It is not always clear whether the whole dose is 'as needed' or only part of the dose. For example: 1x daily 1-2 tablets as needed. This can mean: 1 tablet fixed per day and 1 tablet as needed or, as needed, a maximum of 2 tablets.As needed medication is not included in GDS. In the first situation, 1 tablet comes in the GDS (drug dispensing systems) and 1 tablet is delivered separately. In the second situation there is only separate delivery.The system must make sufficiently clear whether the entire instruction or part of the dose is necessary. The ZIB supports both options described above.